This page undated as needed. Living with lupus for 50 years! I was diagnosed with systemic lupus erythematosus (aka SLE or lupus) in September, 1966. I have had many exacerbations and remissions. However, through the past 50 years, I have helped many people by giving them information, listening to their experiences and fears, and by my living example. My quality of life significantly improved when my husband and I relocated to Arizona from Illinois in 1986. Even though I left my support structure behind, I feel so much better in the dry climate. I was a computer systems analyst since 1974, and had worked for Arizona State University in Tempe, Arizona for 15 years from 1986-2001 and was an Ombudsperson for 8 years. On September 13, 1966, the day after my 19th birthday, I was hospitalized at Illinois Masonic Hospital, Chicago, Illinois. I had been waiting patiently at home for two weeks for a call from the hospital to tell me that they finally had a bed for me. During this waiting period, I had a temperature of 104 degrees, became weak, and my joints, especially my hips, began to hurt, making it very painful to walk. Since I still had a very high temperature, I was placed on an ice mattress and rubbed down with alcohol during the day. Wow..what a feeling to be hot and cold at the same time! I steadily grew weaker, sores developed in my mouth, glands became swollen in my neck, and the I.V. in my arm began to bother me. Each morning, bright and early, a nurse came in and asked me for a urine specimen. After she left, a lab technician came into the room and drew blood, usually between six and ten vials. Soon the doctors came in to see me. They always had some little game they wanted to play. For example, can you touch your nose with your finger, or can you follow the little light with your eyes? After they left, I was able to rest a little, but not for long! I was aroused by someone saying, "Cyndee, I'm here to take you to ...." I'd think to myself, oh, no, not another test! As I lay in the hospital bed, I thought of how exciting and challenging life had been for me. I was active in both school and community affairs. In high school I was a member of the Girls' Athletic Association (G.A.A.) Board, serving as Treasurer, Junior year and President, Senior year, Captain of the Girls' Gymnastics Team, a member of the modern dance club (Orchesis), and a member of the National Honors Society. I had received the G.A.A. 225 Point Award by accumulating points and hours of fun-filled sport in bowling, track and field, and gymnastics. Every Saturday at Illinois Masonic Hospital, I volunteered about eight hours of service as a Candy Striper. I was voted in as President of the Candy Stripers, helped write their Constitution and Bylaws and helped train new Candy Stripers. On Tuesdays I went to Jr. Achievement meetings, where I learned different phases of business. In June, 1965 I graduated in the top 14% of my class from Niles Township High School - East Division, and in September, 1965, I began my studies in the pre-medical technology program at the University of Illinois at Chicago Circle (UICC), where I also worked part-time in the University bowling lanes to earn a little spending money and to meet people. For recreation, I enjoyed many sports. One of my favorite sports was table tennis. Since I was quite a good player, I never had to wait or look for a game because young men would constantly challenge me to a game. I gave them a vigorous and, sometimes, male-ego shattering game. I would run them back and forth from the table, slamming and putting "english" on the ball. At the end of the game, they usually were exhausted, but somehow were able to get up enough strength to put money in a refreshment machine to treat me to a drink. They were really good sports. I bowled with my family on weekends and bowled during the week between classes. I was able to bowl about four games a day. While maintaining an average of 145, I decided to try for the UICC Women's Bowling Team and made it. We spent many hours practicing for intercollegiate competition. I began to be a well-known figure on the UICC bowling lanes because I had a graceful, yet powerful style. I often had an audience watching me when I practiced. My average increased to 200+ and that was with a 10-pound rubber bowling ball. When my family wasn't bowling, we were playing tennis. It was great! Also, I had aspirations of competing on the uneven parallel bars in gymnastics at the 1968 Summer Olympics in Mexico City. Now, I could barely walk across the room. What lay ahead of me...was I dying? Every day my mother was at my bedside from early morning until late at night, watching over me and comforting me. One day as she was sponging me off, she noticed a slight rash on my cheeks and went to find the doctors. Immediately the doctors came in and examined me. Soon thereafter, a specialist came and examined me. New medicines, including Prednisone, were given to me, and as a result, my temperature went down and I began to feel better. During this time, I maintained a sense of humor. Back then, stool specimens were collected in round containers similar to Chinese food take-out containers. I put a slit in the top and asked for donations from the doctors every time they wanted to look at my rash. The doctors were very cooperative and played along. I managed to make money while flat on my back. Since my father, a family physician, had hospital privileges at the hospital, he requested a lunch tray to be delivered to my room so that he could visit with me while he ate. One day I was having difficulty feeding myself. He left the room and came back looking a little weird. I asked the nurses about it later and they told me that he had to go to the Nurse's Lounge to compose himself. Here he was a doctor and couldn't do a thing to help me! Back then, lupus was not known by the general medical community. The specialist they called in could practice all over the world. On November 13, 1966, I was discharged from the hospital. I was not able to walk very well yet, but I was glad to be going home. One day I became very anxious and hysterical about my physical condition and limited activity so my father sat me down, opened a medical book before me and told me that I had systemic lupus erythematosus. He explained that this emotional outburst might trigger a relapse. Up until then, I only knew that I had been very ill and was now recuperating. I was so distraught by the prognosis of 10 years life expectancy after initial diagnosis, which I read in the outdated medical book, that I began thinking about locking myself in my room until I died. My father reassured me that, with the new medicines and treatments, SLE, could be controlled and that I could lead a long and "normal" life. After a few days, I did some serious thinking. I thought it foolish to shut the world out. I thought of the many people less fortunate than I. I was thankful to have both my arms and legs and to have my eyesight and hearing. I began to live each day to its fullest. In March, 1967, I was allowed to return to college on a part-time basis. I changed my curriculum from pre-medical technology to pre-medical records because I could not take Organic Chemistry due to the chemical involvement of the course. This was the beginning of the redirecting of my interests. I had to learn to slow down and become more involved in passive activities, such as playing card games, playing the piano and guitar, reading and knitting. I believe the readjustment period was harder on my family than on me. Before my family was quite sports-oriented and enjoyed spending quality time together. Now that I tired very easily and could not be in sunlight, I usually chose to remain at home and amuse myself rather than go with them and be merely a spectator, wishing to take part. At first my family stayed home with me instead of going out. When I finally convinced them that I was happy at home, they started going out again and enjoying themselves. During the next two years, I was admitted to the hospital four times for neurological problems, mainly headaches and weakening of my arms and legs. I was seen by different neurologists and renal doctors. I underwent spinal taps, electroencephalograms and brain scans. There were always differences of opinions between the neurologists and renal doctors concerning my problems - the neurologists said migraine-related and the renal doctors said lupus-related. Although I had been through many eurological tests and had been pricked by so many needles, nothing conclusive was found. I was even chosen as one of the patients to be presented at one of the Neurology Grand Rounds at Presbyterian-St. Luke's Hospital, Chicago, Illinois. It was quite an experience to be on stage with lights shining down on me in a wheelchair, with an I.V. starting to infiltrate, and having to answer questions bombarded at me from doctors in the audience. In December, 1969, I was admitted to the hospital to be given an experimental drug, Thiocymetin, for 14 days. At this point, I was willing to try anything to help me feel better. I thought...Here I am world...your favorite guinea pig! The first time I took the capsules, I felt like I was swallowing a time bomb. I anxiously waited for the results of the blood tests taken every day to see if they were normal. I was told that one of the side effects of the medicine was the stopping of blood formation. If this occurred, I would have to come in periodically for blood transfusions. Well, I experienced no ill effects from the medicine. What a relief! After this treatment, I enjoyed good health for the following year and a half until I suffered another relapse - headache, right arm numb and pressure in the left eye. This time I was given nitrogen mustard (chemotherapy) over a period of three days. I gradually regained my strength and was able to resume normal activities. During these early years, I learned to be a "patient" patient. I got used to the doctors sticking their heads into my hospital room and saying, "No results yet, see you tomorrow." I learned techniques on how to get through the day, such as imagery, biofeedback, and affirmations. My favorite phrases are: "Strong like bull!" and "I feel terrific! Up to this point, I had completed the equivalence of three years college work after going to school, on and off, for six years. I submitted my application to finish the fourth year of the medical records program at the University of Illinois Medical Center. Unfortunately, there was room only for 15 full-time students from Urbana, Circle Campus and out-of-state students. Since I had gotten good grades, my counselor advised me to apply anyway as part-time and see if I would be admitted. I was not. Now, where was I to go? I decided to get a full-time job on-campus as a Clerk-Typist III in the Room Reservations Department for the student union. I really enjoyed working there because I was able to help set up meetings and activities for different student and faculty organizations. It gave me the opportunity to meet many weird (it was the 60's) and wonderful people. I worked there for three years. In May, 1974, I decided to resign from my job and look for "greener pastures" in the computer world. During college, I had taken a computer course as an elective and had found it quite interesting. Two weeks after I resigned, I began to experience tingling sensations on the left side of my brain and weakness on my right side. I progressively got worse and was admitted to the hospital in June. I underwent more neurological tests, a spinal tap, a brain scan, an EMI scan, and an electroencephalogram. My steroids were increased and then decreased over a period of three months. My condition did not change, though. I was readmitted to the hospital in September for nitrogen mustard again, but this time it was administered over a period of four days. I was super sedated and was "out-of-it" for a few days. I was sent home after the treatment and stayed home until January, 1975, when I was permitted to start taking a COBOL programming class, which met twice a week for two and a half hours a day at Oakton Community College. I was on my way to earning an Associate of Applied Sciences Degree in Data Processing. From 1974 to 1983, I enjoyed relatively good health. I had a full-time job at a small family-owned chemical company. I had started out as the secretary for the Management Information Services Department (computer department) since I typed over 100+ words per minute, had a chemistry background so I was familiar with terminology, and had taken computer programming languages. However, my supervisor saw potential in me and trained me to become a systems analyst. I was accepted at Roosevelt University to obtain a Bachelor of General Studies Degree in Computer Science. I took one class a semester at night. The company paid for the tuition. However, I was only able to attend five semesters. My system didn't like working full-time and going to school at the same time. My college education had to be put on hold once again. I didn't want to get married because I didn't want to be a burden to anyone outside of my family. My friends told me that I had so much love to give and that I would be selfish if I didn't give a man a chance to love me. They told me that, if he really loved me, it wouldn't matter if I had lupus. Well, in 1976 at age 29, I met Bob, who was hired as a programmer in my department. When he started showing signs of getting serious, I got scared. I gave him all of the literature that I had on lupus and my father talked to him about what he could expect. However, this didn't discourage him. We were married in May, 1979, and 37 years later, I am very happy that he's still with me! From 1984 to 1993, I had many flare-ups, five hip surgeries (core decompressions of both hips, total hip replacement of both hips, and revision of my left total hip replacement), three exploratory abdominal laporatomies (one resulting in my gall bladder being removed), and a total hysterectomy. From March 1984 through March 1985, I was in the hospital 265 days out of 365 days! During this time, I was given Cytoxan (chemotherapy) to help arrest the lupus activity. I lost my waist long, black hair. I was devastated! Also, my Prednisone (steroid) dosage was increased. End result...I was a bald, fat, short person, who didn't want anyone to see me, even my closest friends. My self-image was very poor. However, I let myself grieve over this loss and regained my positive mental attitude. After my right hip replacement in December, 1985, Bob and I considered moving to a drier climate for my health before the winter of 1986. My arthritic pains were really taking their toll on me. Also, Bob didn't want me to fall down due to the snow and ice and hurt my hips. I was apprehensive about moving, though. I had grown up in Michigan and Illinois. I was used to the cold and damp weather. When I was diagnosed with lupus, I thought the way that I felt was just the way I had to feel for the rest of my life. Bob wanted to move to Arizona. I was terrified. Through the years I had been told by the doctors to stay out of the sun. Now, my husband was asking me to move to the Valley of the Sun! I consulted my lupus doctor (I had been with him for 18 years; he was like my big brother) and he told me that he thought it was a good idea for me to move. He said that I would do as other Arizonans...stay indoors during the day and use sun screen when outside. He found out for me that there was a lupus chapter in Phoenix. So, I felt a little bit better about moving. However, I would be leaving my family, my support structure, behind. Bob, Corey (my beloved teddy bear) and I moved to Arizona in September, 1986. After two months, my arthritic pains were gone! When I lived in Illinois, if I went to the shopping mall, I had to sit down every 15 minutes to rest because I hurt and was tired. In Arizona I can walk for a long time. The first time my parents visited, they couldn't believe that I was the same person. I was so energetic and wanted to show them around. Our decision to move was the best decision we have ever made! In 1991 I contacted Roosevelt University and made arrangements to finish my degree via correspondence courses. I only had four core courses and the senior thesis to finish. However, I was able to complete only the first two modules of the first core course before my lupus started to act up again. From 1994 to 1995, I was healthy and found a new hobby, archival (acid-free) scrapbooking and rubber stamping. I met new friends going to workshops. I also renewed my interest in putting jigsaw puzzles together. These activities were good for my manual dexterity. During the early years, my doctors had told my mother to make sure that I used my hands so that I wouldn't get arthritis in them. So, I was always playing the piano, knitting, putting jigsaw puzzles together, or doing counted cross-stitch. 1996 - Milestone Year - 30 Years Living With Lupus! Unfortunately, on May 15, 1996, I suffered a small brainstem stroke while at work. The mild right side weakness only lasted for a few days. However, for four months, I had a whopper of a headache, extreme pain on the left side of my head, extreme vertigo, and a slight form of dyslexia. The stroke had caused a decrease of blood flow to my left inner ear, resulting in it functioning only 38% capacity. I worked with a speech therapist for five months for the dyslexia and general mental exercises. I'm glad to say that I suffered no permanent disabilities! I returned to work mid-October, 1996, with the understanding that I was to take time-outs in the morning and afternoon and take my full lunch hour without work in front of me. I am a Type A person and am always doing something and enjoying it! The possibility of having a recurrent stroke within one year is very high so I have to try harder on taking my timeouts. While recovering from the stroke, I asked myself, "What is my mission in life?" Why was I having to endure and survive all of the physical and mental challenges of lupus? My mission became clear to me when I returned to my full-time job. Within three weeks, two people told me that they were recently diagnosed with lupus and three people told me that they had a friend or relative recently diagnosed with lupus. They wanted to know if I could help them and provide them with information about the disease. Help other people with lupus and help spread the word about lupus. All these years, I have been very fortunate to have the most understanding and compassionate bosses. My job has always been secure. Knowing this has really helped when I was out sick...one less thing to worry about! The knowledge that I have today is the result of my college education, on-the-job-training, technical workshops, and support from my bosses. How have I been able to live with lupus this long? Well, it has alot to do with how I was brought up. My father had drilled into his children that we could do anything if we put our mind to it. He established a positive mental attitude environment at home. My mother was my caregiver and gave me emotional support. She made many trips to the doctor (waiting for hours sometimes) and trips to the Social Security Office (guaranteed to wait hours) with me. Often I was in a wheelchair so she had to deal with loading and unloading it from the car. To this day, she still tells me, "This too shall pass." She always knows when I am hurting, even though I don't say anything. She just helps me without saying a word. My faith in God, the prayers, love, understanding, encouragement, and support from my husband, parents, siblings, friends, and coworkers, and silent comfort from my 59 teddy bears, have given me the strength to endure all. In addition, Judy, my best friend since high school, has always been there for me. We have spent many hours together - talking, laughing, and crying. Even though we live 3,000 miles apart, she is only a phone call away. There have been numerous times that she has made personal sacrifices to be by my side during difficult times. Also, I must thank Judy's family for allowing her to do so. I'm looking forward to another 30 years! With a positive attitude, I can accomplish anything! God willing, I hope I will continue to be an inspiration to other lupus patients by my living example. I started the first three months of 1997 with a sinusitis/upper respiratory infection that took five antibiotic treatments [Amoxicillin, Cefaclor, Cipro, and Biaxin (2x)], decongestants, nasal sprays, short-term steroid treatment in addition to my regular daily 1.5 mg of Decadron, and steam to get rid of it. On March 13th, I suffered another stroke! Thank goodness I didn't get vertigo this time. I had a severe headache, nausea, trouble concentrating, slow speech, dizziness, weakness in my right arm and leg, and head and right arm tremors. I stayed home for a week since I was tired and my legs were very weak. Good news again...there was no permanent damage. The neurologist wasn't sure if the strokes are related to my early years when I had central nervous system involvement. I'm supposed to continue taking Calan SR (reduces stroke-like events and vasospasms) and Ecotrin 325 mg (aspirin). I had to stop Ticlid because I was getting fist-size bruises without hitting anything! My lupus doctor said that my sed rate was elevated, RNP was positive (can't correlate it with CNS involvement), and my complements were normal. He couldn't really say if I was having a mild lupus flare or not. When I asked both doctors, "Why are my legs weak? ", they both responded: "It might be from the stroke and/or the lupus." Same old response! At the end of April I finally admitted that I needed progressive glasses...my arms just weren't long enough anymore. I had been in major denial for three years. Since July, my orthopedic doctor had been trying to determine what to do about pain in my right subtalar joint in my ankle. We tried three cortisone shots which had no effect. For six weeks, I tried resting my ankle by using crutches with minimal weight bearing and heat each day. If nothing alleviated the pain and swelling, I might have faced arthroscopic surgery. Good news! My ankle got better. However, now I have to wear orthodics for support. Daily affirmation...I'll keep on going...just like the little pink bunny! Well, I've reached the first stage of senior citizen status... I turned 50! Where did 1998 go to? Each year seems to be flying by. I started the year with the stomach flu. I lost 12 pounds in less than 5 weeks. I had continuous abdominal pain so I had a CT scan of my abdomen. A general surgeon didn't see anything conclusive to warrant surgery. However, he hospitalized me so that tests could be done quickly and the doctors would have to come to me instead of me getting referrals, setting up appointments, going for tests, going back to the specialists, etc. I was given an IV to keep me hydrated since I was eating only 500 calories a day and then was put on NPO for a colonoscopy, esophogastroduodenoscopy, and small bowel follow through. I also had blood tests (including amylase and lipase) and urine tests (including amylase and porphyrin (test for porphyria metabolic disorder)). During this time, my rheumatologist told me that there was no indication that my lupus was active. He told me that maybe my abdominal pain would go away as mysteriously as it came. At least I had pain medication to take at night to help me sleep. I'm glad that my tests showed that I didn't have cancer, no ulcer, no bleeding, no diverticula, no irritable bowel syndrome, no colitis, no parasites, no c.difficle antibody toxins, no problem with my thyroid, no nothing!! But, I was SO unhappy that I had to play the wait and see game once more. Well, my rheumatologist was right. In October my abdominal pain disappeared! I'm was a happy camper once again. Other than the abdominal pain, I felt great all year. However, I had to have a heart-to-heart talk to myself to slow myself down because I was getting stressed out at work. I discovered line dancing, which I do on Wednesdays and Thursdays. It's great fun and an excellent stress-buster! This was a milestone year for my husband and I. We celebrated our 20th wedding anniversary. I felt very well, except for an unexplained numbness and swelling of my left leg which lasted a few weeks and then went away as mysteriously as it came. My annual bone density scan showed that it has increased since last year! I thought as you got older it decreases. My Rheumatologist was very pleased and told me to keep up what I'd been doing. The only thing different in my life since my last bone density scan was line dancing. I am now dancing 4 hours on Wednesdays, 2 hours on Thursdays, and 2 hours on Sundays. An article, "Outdistancing Osteoporosis" in the Healthy Living section of The Arizona Republic newspaper on Thursday, October 21, 1999, listed dancing as one of the weight-bearing exercises that put stress on the bones to help preserve bone mass. So, I'm going to keep on dancing into the 21st century! This year was a year to test my patience. In the Spring, due to unknown cause, my left leg, ankle and foot became swollen. After a few weeks my leg and ankle were no longer swollen, however, my left foot required 3 cortisone shots before the swelling subsided. In the Fall I started having pain in my neck with pain traveling along my left shoulder and down my left arm to my hand. An MRI showed narrowing between the C6-C7 cervical spine in my neck. The C7 nerve root goes down the left arm. The nerve might be irritated by this narrowing or by lupus. An epidural anesthesiologist gave me 13 trigger point injections in my upper left back and shoulder and 3 epidural steroid injections between C6-C7. These did not help at all. 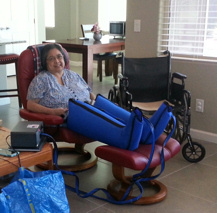 I also had 21 physical therapy sessions with exercises to stretch and strengthen my neck, back, shoulder and arms, electrical stimulation to block the pain signal, and ultrasound with moist heat to promote blood circulation in my upper back. I was on very strong pain medication, which might have affected my stomach so my family doctor started slowing decreasing it. Since there isn't clear evidence what is causing the pain, the neurosurgeon does not recommend surgery at this time. Meanwhile the pain is constant. So, I decided to enter the world of Oriental Medicine and acupuncture to see if it can help manage the pain. Unfortunately, the acupuncture did not help the pain or stomach problems. I lost 40 pounds since November 2000. I became extremely dehydrated since I couldn't eat or drink anything because it hurt my stomach...couldn't even make saliva. In January 2001 I was hospitalized for 2 weeks and was given fluids and electrolytes through an IV. I had an EGD (esophogastroduodenoscopy) and a CT scan of my abdomen and pelvis - both were normal. The doctors put me on medications to sedate and relax me. However, the stomach and abdominal pain persisted and my liver enzymes were very high. In February I had a spiral CT scan of my pancreas (was normal) and in March I had an ERCP (Endoscopic retrograde cholangio pancreatogram) where the surgeon removed small sandlike stones from the common bile duct and cut scar tissue (papillary stenosis) at the opening of the duct. During this time, all of my joints hurt...my lupus was active even though my blood work was normal. So, my Rheumatologist increased my steroids slightly for 9 weeks until my symptoms subsided. My neck pain finally went away in April after months of physical therapy, bed rest and medication and was able to return to work in my office in mid-April. In July I had my 8-month checkup with my Orthopedist. X-rays of both hip replacements showed deterioration of the polyethylene. The left one was serious enough to warrant immediate replacement. So, I was scheduled for surgery. This was the beginning of a very trying time for us. In summary I also had emergency abdominal surgery, was in traction for a month to set a fractured fragile left femur, wore a custom-made leg fracture brace from groin to tip of toes (wore for 10 months) and sent to a rehabilitation facility for intensive physical and occupational therapy for two weeks, was on a respirator in ICU for 3 days due to respiratory failure after an allergic reaction to fumes after the installation of a new heat pump for the house, and finally in June 2003 surgery to put in a new hip prosthesis 22 months after first hip surgery. I have been bedridden since August 2001 and have to depend on Bob and my mother to take care of me. The only time I go out is to go to a monthly doctor appointment. Although I can no longer work, my spirits are high and I spend my day watching TIVOed satellite TV shows to keep up on current events and entertainment and putting jigsaw puzzles together I'm definitely missing line dancing, which is unfortunately a thing of the past. I am so blessed with a loving husband, family and friends to help me through this very challenging time. I continue to keep my faith and know that God has a plan for me, and a reason for me going through this. While looking at our "children" (59 teddy bears) during the 2004 Christmas season, Bob and I decided to donate 39 of them to the Sunshine Acres Children's Home so that needy children could have something to cuddle up with. We miss them, but we know that they are being loved. 2006 - Another Milestone Year - 40 Years Living With Lupus! I can't believe it's been 40 years since my diagnosis, especially since the early medical books stated that life expectancy after diagnosis was 10 years.I am truly blessed! The doctor told me to be patient for the muscles and ligaments in the left leg to be retrained after being without a hip for 22 months. As I relax, I think about what I have endured and what I may do in the future to help lupus patients. I have found two more things to enjoy: "Tangoes" (arrange 7 geometric shapes to match picture on a card), "Sudoku" and "Kakuro"(current logic puzzle crazes). I can't do these, though, for very long because I get very tired and lose my concentration. A medical uneventful year is a "good year"! I turned 60 and am now taking advantage of Senior rates at the movies. I got a kick out of showing my ID to prove my age. I also retired on August 1st. I started scanning old photos (restore, resize, document) since my childhood so I can put them on DVDs. I continue to carry a Sudoku book and pencil with me wherever I go. Since I hadn't walked normally since 2001 due to the 4 hip surgeries and recovery, I had been sedentary for 8 years. I decided to start walking in the mall with Bob. As usual I pushed myself too far again! I increased the walking distance each day for 3 days straight. The result: Pain in my right ankle and left foot. I was put under the care of a podiatrist for overuse tendonitis of my right Achilles tendon, plantar fascitis and posterior tibialis inflammation on my right foot/ankle. I also had plantar fascitis of my left foot and the metatarsals were irritated due to compensating for the left leg being 1/2 inch shorter than the right leg. I have physical therapy two times a week for rehab, strengthening and gait training. When all of the pain is gone, he will give me a walking routine. Until then, no mall walking for me. He also put 1/4 inch heel lifts in my shoes to take the strain off the Achilles tendon. Other than this mandatory rest period for me - life is great! I had a severe nose bleed on April 23rd. I expelled 2 large blood clots and my husband and I couldn�t stop the pouring blood so Bob called 911. While in the ambulance, blood started flowing out of my eyes. I was a person of interest in the ER because none of the staff had seen this before. The ER doctor packed her left nostril and the bleeding stopped after 2-1/2 hours. It was difficult to stop the bleeding since I take an aspirin a day after my stroke in 1994. My body�s ability to clot was affected by the aspirin, garlic and fish oil (all blood thinners) that I take daily. My immune system was really compromised and left me very weak. I was discharged after 6 hours. When we returned home, Bob cleaned up the bathroom. There was 2 inches of blood in the sink! For 4 days I had to sleep with my head elevated at 45 degrees and was sedated so the stress wouldn�t cause my lupus to flare. On April 27th our ENT removed the packing and the left nasal passage looked good. I couldn�t blow my nose and had to open my mouth when she sneezed. We, think, when the ENT doctor scoped me on April 15th to check my vocal chords (I had been coughing since December), he might have broken a capillary in my nose, causing a slow bleed which would explain the color and size of the clots (looked like chicken livers) she expelled. It took me 3 months for the nasal tissue to heal and get back to normal. If you want to see how I looked with blood flowing from my eyes, click here. I had cataract surgery for both eyes and am very happy to see clearly again. In April I fell down steps and had a large wound on my right shin that became infected. I spent 12 days in the hospital and 20 days in a care center. The wound looked like Mike Tyson had taken a bite out of my shin. I definitely didn�t like it when the nurse cleaned the wound with acetic acid. Thank goodness for morphine! Since bone was exposed by the wound, my body has to create new layers of skin. The healing process will take about a year due to the lupus and steroids I take. If you want to see the wound, click here. In March I had bronchitis and it turned into laryngitis. No April Fool's Day joke...I woke up on 4/1, stepped out of bed and felt a sharp pain in my right ankle. After 2 weeks of pain, I saw my orthopedist who ordered an MRI. I had a 3.8 cm longitudinal split tear in the posterior tibialis tendon of my right ankle. I was to wear an immobilization boot for 6 weeks to see if the tear would heal on its own. If it didn't, surgery would be required. However, I developed a 2 inch by 1-1/2 inch red, itchy area to the left of my shin wound scar. My family physician said I had �contact dermatitis� probably from the boot. He took pictures because he had never seen anything like it before�showed me off to his partners. I seem to always have something unique to show off. The rash had perpendicular rows to my leg. He told me not to put the boot back on. After consulting with my orthopedist, I had to use my wheelchair and only walk to the bathroom. I applied prescription cortisone cream and took Benadryl for the itching. In June my family physician performed a puncture biopsy on a very swollen, purple bump on my left breast. He started treating me for possible MRSA (Methicillin-resistant Staphylococcus aureus is a bacterial infection that is highly resistant to some antibiotics) with Clindamycin (antibiotic) and Altabax (anti-bacterial) ointment. MRSA is what caused me to have my left hip replacement removed in 2001. After taking only 4 capsules of the antibiotic, I had an allergic reaction and had a rash all over my body including my head. The itching drove me crazy! A few days later I noticed 3 pink spots (blisters) around the puncture wound. I saw my family physician the next day and he started treating me for Stevens - Johnson syndrome with high dosage of steroids (200 mg Prednisone daily) for 5 days. If I had gotten more blisters, I would have had to be hospitalized. He hoped we caught it in time so the morbidity (not a word one wants to hear) was low. Fortunately, the puncture wound and three Stevens � Johnson Syndrome blisters healed. SJS is an incident-related syndrome. Once the blisters are gone so is the SJS. It can recur when my skin and mucous membranes react severely to a medication or infection. Since my orthopedist hasn't done the type of surgery required to repair the split tear in the posterior tibialis tendon in 10 years, he referred me to an Ankle and Foot Orthopedist.� He is treating me conservatively, not rushing to do surgery.� I was fitted with an ankle hinge brace.� I also had physical therapy to regain strength since I've been sedentary since 2001.� He says it usually takes a normal person 9-12 months to heal and I'm definitely not normal with a systemic auto-immune disease. I will see him again in April 2012 for a 12-month follow-up. On December 20th my dear daddy passed away. I was very close to him. I miss my daddy SO much! Yes, I still call him "daddy" at age 64. Every night before I go to bed I talk to him and tell him about my day and how my Mom is doing. Since he couldn't hear, we had established a way of saying goodbye to each other by doing the American Sign Language Sign for "I love you". So each night I sign him "I love you" click here. In August I had acute pneumonia that took most of my right lung, probably Valley Fever, and my airway was extremely inflamed causing asthma that triggered bronchospasms. I was in the hospital for 21 days and rehab for 21 days. In November my pulmonologist said that the repeat CT Scan Thorax showed that I have complete recovery from the pneumonia and do not have asthma. However, I still need to complete the 6-months Diflucan 400 mg treatment and finish the bronchodilators (oral and respiratory medications). He�s going to give me a breathing test at my follow-up appointment in late January, 2013. If it�s okay he�ll move to Symbicort Inhalation Aerosol. Ophthalmologist - my eyes have gotten better! Orthopedist � no change in x-rays of both hip replacements from 3 years ago. However, once in a while I have a hitch in my giddy up in my right leg � probably due to muscles; when get out of bed or sit for a period of time, the muscles aren�t stretched. He wants to follow-up in a year. My dear mamma (85) passed away due to congestive heart failure comfortably and peacefully on March 26, 2013 at 8:28 PM MST with her family at her side. On May 24th, our family had a Celebration of Life service to honor her. She was laid to rest with daddy, who passed away December 20, 2011 (15 months earlier) at the National Memorial Cemetery of Arizona. Both of them are forever in our hearts. I always called my father, daddy, and my mother, mom. However when her dementia worsened, I started calling her mamma. The hospice caregiver told me that it was normal because I wanted my mother. Towards the end mamma always had her eyes closed and her mouth open, but the hospice caregiver told us that hearing was the last sense to go. We always kissed her on her cheek or forehead. One day I told her that she was going to do something they�ve never done before. I said, I am going to kiss you on your lips. She closed her mouth and I kissed her. Mamma heard me! After she passed, I climbed up onto her bed, put my arm across mamma�s chest, rested my head against hers and fell asleep. We were both at peace. I will cherish these moments forever. She truly passed away at home. She was in her bed that she and daddy shared for 65 years surrounded by bedroom furniture that they had as long as I can remember and the assisted living building she was in was called the "Miller Building". We miss her so very much, especially her smile. She always had a smile on her face until the very end. If you're interested in knowing more about my amazing mamma, please click here. From July 2012 to May 2013, I was functioning on pure adrenaline. My family wanted to make sure that all of mamma's needs were met in a timely manner. I rested as much as I could, but all the activity took a toll on me. The day after her service I was too tired to get out of bed. My body was telling me that all my responsibilities were finished and I could rest now. In July I had a recurrence of asthma exacerbation and Valley Fever...same as last year. I was hospitalized for 3 days until my airway opened up. The pulmonologist didn't want me to be exposed to any infection while I recovered so he wanted me to stay at home for 3 months only clearing me to go to medical and hairdresser appointments. During this time, I my legs weakened despite my chair and bed exercises and I gained weight. Why is it so easy to put on weight and VERY hard to lose it? The pulmonologist wants to take a proactive approach to keep me healthy and out of the hospital. Since I take Dexamethasone daily for the lupus and I have a small airway (size of an infant), I am more susceptible to a repeat Valley Fever episode. Apparently, Valley Fever fungus grows very slowly so I will be taking Diflucan, an antibiotic specifically for fungus-Valley Fever, and a bronchodilator for the rest of my life. I started participating in a balance class on Tuesdays and Thursdays. It is very helpful in my recovery. When I am stronger, I will add a strengthening class using bar bells. This year I was monitored by a Urologist for recurring urinary tract infections and overactive bladder, a Hematologist for increasing Lactic Dehydrogenase (LDH) in my blood, a Pulmonologist for proactive treatment for the rest of my life for Valley Fever and associated asthma, and an Orthopedist for pain in my right knee which ultimately ended in knee replacement surgery in October. The surgery went well and inpatient rehabilitation therapy was good so I went home to continue therapy with home therapy. My right knee and leg were getting stronger, however, I strained the lateral and two medial tendons in the knee. The pain was intolerable so I went back to inpatient rehab for daily therapy and pain management. I finally returned home on Christmas Eve day and have already started home therapy again. I cannot put full weight on my right leg yet. I'm starting 2015 getting stronger. I have an excellent exercise program with 1 lb., 3 lb. and 5 lb. dumbbells to strengthen my arms and core. 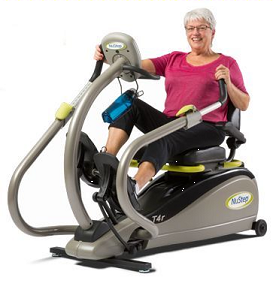 My husband bought me a NuStep TRS 4000 Recumbent Cross Trainer which will be delivered the second week in January. I'm SO excited! To keep my sanity this year I've had to be a "patient" patient. I have 14 specialists treating me for various medical problems from head to toe. The doctors are trying to figure out why I have dry mouth all of sudden. I have been on medications that can cause dry mouth for years. It's so dry that the inside of my mouth sticks to my teeth. Since I don't make saliva, I can't eat graham crackers with peanut butter. It's a big deal for me. When I do my home physical therapy exercises using the 4-wheel walker, I can only walk 200 feet before I get short of breath due to the dry mouth closing up my small airway. Since I use my arms to take the weight off of my leg, my shoulders and triceps hurt. I'm continuing outpatient physical therapy sessions for reconditioning, gait training, and ASTYM and manual treatments on my right knee. The combination of adhesions on my right IT band and knee cap, and tight quadriceps and hamstrings, pull my knee inwards. I still can't put full weight on my right leg. To complicate matters, both of my legs, feet and ankles are very swollen with pitting edema. Also, my skin has become very fragile with age and from being on Dexamthasone for years so I'm getting skin tears. Bob has to check me daily so we can treat them immediately so they don't get infected. The only time I leave the house is to go to a doctor appointment or medical test. Bummer! I'm hanging in there, though. I'm strong like bull! Bob knows what I need before I even know that I need it. He is the greatest husband. He does everything around the house. My only responsibility is to "stay standing" (aka "SS"). He says it�s a good day when he wakes up and I'm in the house, not in a hospital or rehab facility. He has his own medical problems. He is also having physical therapy treatments for his back and his right knee. So, transferring my 4-wheel walker and companion wheelchair in and out of the trunk takes a toll on him. After living in the same house since December, 1986, we decided to downsize or �right size�. So, we put the house up for sale and purchased a new house. Bob worked very closely with the architect to make modifications to the model for handicap accommodations for me. My bedroom is set up so that I can easily work at my computer desk and my medicine desk while sitting in a wheelchair. The bathroom has a walk-in shower with NO lip to walk over; there are grab bars in the shower and the toilet room; one of the sinks is lower with open access so I can wheel up to it in a wheelchair. Also, there are handicap high toilets in the other 2 bathrooms. We closed on both houses on Wednesday, March 26, 2014...one year to the day that my mamma passed away. The title company chose the date. I believe mamma had something to do with this so she could be present with us. Please don't think that I'm crazy. Bob was able to attend a few live community theater performances and see some movies after dinner to unwind. He likes the new theaters that have reclining seats and food is brought to him. He deserves to be pampered. 2016 Bob and I learned our new "normal"
Daily routine consists of me waking up at 6:00 AM to take my first medications of the day and morning grooming. Then, for six hours I wheel myself in the wheelchair to the bathroom due to the combination of taking Furosemide, a diuretic, and an overactive bladder . . . not fun! In between runs, I work on the computer updating our medical records and try to keep up with correspondence. We have lunch at 11:00 AM. Now it's time for me to have a lymphedema pump treatment. I lay in the hospital bed with my legs elevated with 3 pillows from 1:00 PM to 8:00 PM. We have dinner and then Bob does wound care for me. I have had extremely swollen legs and ankles for 1-1/2 years. So, my symptoms are a continuation of my 2015 symptoms . . . left & right legs, feet and ankles are VERY swollen, pitting edema left & right legs, shortness of breath when walk 100 ft. due to dry mouth closing up airway, left vertical shin blisters, and my whole body is weak. The doctors don't know what precipitated the dry mouth. My pulmonologist prescribed Montelukast which helps and I am using ACT Total Care Dry Mouth Anticavity Mouthwash and ACT Dry Mouth Lozenges. I had three vascular surgeries on my legs to help reduce the swelling. However, after the first lymphedema pump treatment, blisters started popping up on my legs! So, I stopped the treatments for three months. I'm gradually increasing the mmHg and treatment minutes in hopes the swelling goes down enough for me to put on shoes. For exercise, I'm using my NuStep. The only time I leave the house is to go a doctor appointment, medical test, and haircut/facial/manicure. I enjoy getting out of the house. The day after Thanksgiving my sister, brother and his partner brought Thanksgiving dinner food from the family dinner at our niece's house. I sampled EVERYTHING! Kudos to all the cooks. It's very weird . . . didn't feel full. We played Phase 10 after eating and the men won�same score even. Guys look out the next time the women will reign! Bob was able to attend a few live community theater performances and see some movies after dinner to unwind. He likes the new theaters that have reclining seats. When I'm sitting at the computer, I love watching our animal visitors in the backyard. We see butterflies, humming birds, quails, and bunnies. Our favorite is a little bunny we named "Nibbles". He lives across the street. Bob continues to be my rock! Wishing you a happy, healthy, fulfilling and prosperous life!